The two-hour drive from Portland to Mt. Hood is a destination in itself, featuring an evolving landscape of dense towering conifers, open vistas with rolling foothills, punctuated by ever-closer views of Mt. Hood. The highest peak in Oregon (11,245 feet/3,427 meters) is a must for any visitor, whether for the year-round skiing, hiking, mountain biking or any of the other list of outdoor activities… or to just simply to relax and enjoy up-close views and fresh mountain air. The good news is you don’t have to drive there. There are plenty of access options including public transportation, private shuttles, ride shares and seasonal ski area transit. Enjoy the views and leave the driving to the pros. Mt. Hood Express transit is a public bus operating seven days a week between the city of Sandy and Timberline Lodge & Ski Area with stops at Skibowl West, the Best Western Mt.Hood Inn, Collins Lake Resort, and Government Camp East before the final climb to Timberline Lodge & Ski Area. There are six Express bus runs every day and one additional late night bus run during the winter season from December 1 to March 31, 2o19. One-way fare is $2 and an all-day ticket is $5 (exact change required). The all-day ticket is valid for the Sandy Area Metro (SAM) buses running between the TriMet Gresham Central Max Station and the Sandy Transit Center. (Portlanders can hop on the MAX Blue Line, which runs from Hillsboro to Portland City Center and the Rose Quarter to Gresham.) At the Sandy Transit Center board the Mt. Hood Express up to the mountain. The Mt. Hood Express bus is equipped with a rear ski box during the winter and a 10-20 capacity bike trailer in the summers. Note: Buses do not operate on Thanksgiving or Christmas. And new for winter 2018-19: riders are now able to track both SAM and Mt. Hood Express transit on a new app providing information on arrivals, delays and traffic updates. Please note that Mt. Hood Express is frequently at capacity, so it’s always a good idea to arrive early. Aspen Limo Tours offers year-round, private luxury transportation that includes 40-person limo buses, 12-passenger Mercedes Sprinter vans and six-person SUVs. 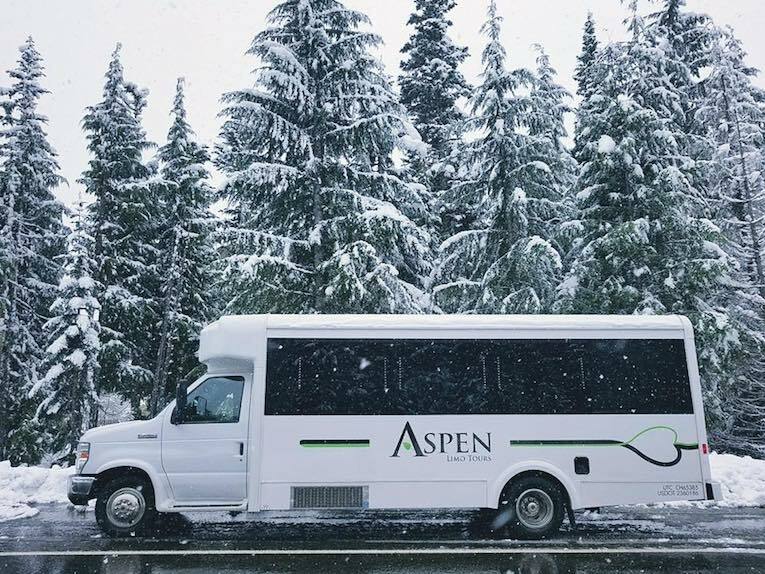 In the winter months, Aspen Limo Tours offers popular Mt Hood Ski Trips with luxurious executive vans, SUVs and 4×4 buses outfitted for winter with studded tires or chains. Call 503-274-9505 for specific details and ask about discounted lift tickets at Meadows and Timberline Ski Area with ski area destination bookings. Aspen Limo Tours is also PDX airport pickup approved. Sea to Summit offers custom shuttle service to Mt. Hood in 4X4 Mercedes-Benz Sprinter vans. The vans hold up to 11 people and are available by reservation at 503-286-9333 or online. 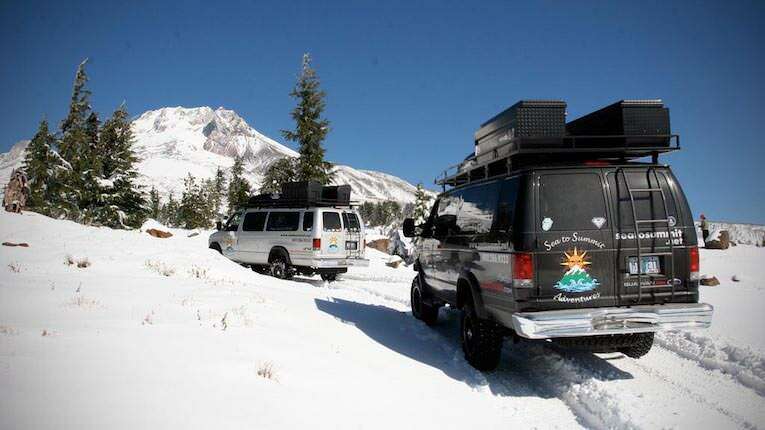 During the winter months, Sea to Summit outfits its 4×4 vans with ski racks and studded snow tires and offers scheduled service to Mt. Hood Meadows, Timberlineand Mt. Hood Skibowl. There are two early morning Portland pickups at REI in the Pearl District (14th & NW Johnson at 7:15 a.m.) and Pioneer Square (in front of Starbucks on Broadway and Morrison at 7:30 a.m.). The shuttle is by reservation only with a minimum number required before confirmation; pricing starts at $59 per person. Drive Less Connect is a unique-to-Oregon ride-sharing site. Travelers can coordinate trips of all types — one-way trips, long-distance trips, even last-minute trips — to Mt. Hood. Visitors must log into the Drive Less Connect website and choose a specific destination from the menu. You’ll be able to enter general destinations such as the town of Government Camp or the exact Mt. Hood ski area or lodging destination you plan to visit. During the winter, Mt. Hood Meadows offers round-trip transportation from Portland to the mountain, offering pick-up in three locations around Portland including Tualatin, Beaverton and Gateway. The luxury, biodiesel-fueled motorcoaches drop off right in front of the main lodge at Mt. Hood Meadows. Discounted lift tickets and reduced-rate beginner packages are also offered with your $25 bus ticket. Tickets go on sale one month in advance and are available for purchase through the Mt. Hood Meadows website. Another new Portland-based shuttle option is the Green Dream Bus, with scheduled trips from ReRack in Portland to Mt. Hood Meadows for $29.95 roundtrip. 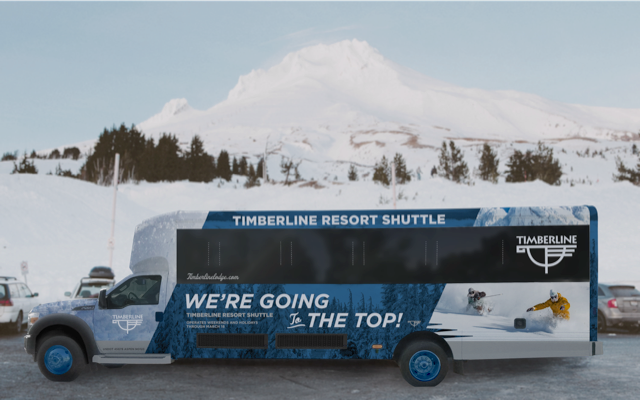 Timberline Lodge & Ski Area offers winter transportation up to the resort from locations around Government Camp beginning November 23 though March 24, 2019. The Timberline Resort Shuttle operates on weekends and holidays from 9:00 a.m. – 4:30 p.m. This local shuttle offers continuous round-trip circulation with two stops in Government Camp at Mt. Hood Brewing and Summit Ski Area (now owned and operated by Timberline), on up to the Crescent at Timberline’s Wy’East Day Lodge. The first pickup is at 9:00 am at Mt. Hood Brewing, the last pickup is at 4:30 pm at the Crescent Day Lodge. Riding the shuttle is free for Timberline and Fusion season pass holders and Timberline online lift ticket holders. Skibowl operates a free shuttle connecting Skibowl East & West villages with stops in Government Camp at Collins Lake Resort, the Ratskeller Building and Mt. Hood Outfitters. The shuttle runs Friday and Saturdays at 8:45 am to 11:15 pm, Sunday and holidays from 8:45 am to 10:15 pm, and Monday to Thursday on demand for guests of Collins Lake Resort. A free shuttle service between Hood River and Mt. Hood Meadows operates four daily round-trips on Saturdays and Sundays through February, plus President’s Day. The buses leave from the Hood River Event Site along the waterfront. Check back for the updated 2018-19 schedule. 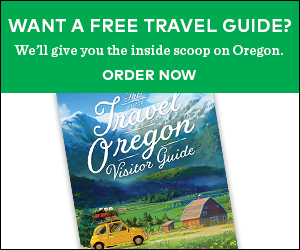 In partnership with the University of Oregon Outdoor Program, Berg’s Ski & Snowboard Shop offers regular winter shuttle service from Eugene to Mt. Hood Meadows, Hoodoo, Mt. Bachelor and Willamette Pass. The price is $25. Sign up on the Berg’s Ski Bus website or by calling Berg’s at 541-683-1300. Annie Fast is a lifelong snowboarder and traveler. She was the editor of TransWorld Snowboarding Magazine and prior to that worked at the summer snowboard camps on Mt. Hood. 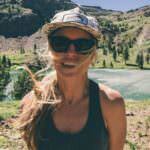 Annie writes about outdoor adventures from her home in Bend. Snowana – A Mountain Party in the City!